Pointehaven makes the best flannel. We have some of their sheets too. I was so excited when I say a duvet cover available. My son loves this on his bed in the winter. The dogs are so cute. Sleep warm on cold nights with this heavy weight flannel duvet set, playfully patterned with red-collared dogs. Evoking happy holidays, this set is made of 170 GSM 100 percent cotton flannel, oversized for comfort and machine washable for easy care. I was looking for something inexpensive but 100% cotton. This fit the bill, and is much softer than I had anticipated. No strange smell out of the packaging. The colors are as they appear online, as is the pattern. I'm not a big fan of the print, since to me it looks more fitting to put on my sleeping dog, but since I this is covered by a more decorative cover in the day it does not matter to me what the print is. If the print doesn't matter, or if you like the print, I say go for it. The price is really good considering the super softness and quality of the set. So soft against your skin! My son wanted to upgrade his room and chose this duvet for his new queen bed. He absolutely loves the dog motif and the soft feel of the duvet cover. The whimsical graphic patterns on this flannel duvet cover makes my bed even more inviting. I bought this flannel duvet set for my son-it's really cute! And warm. Plus it didn't pill when I washed & dried it. Love the dogs and the flannel material. Size is perfect for my split king bed! Definitely recommend it! I bought this duvet months ago to go in a dog themed bedroom for my visiting son and daughter. I thought it would be fun as they love dogs. I also bought a dog lamp from Overstock which ties in nicely with the duvet. It's held up very well. I get many compliments on the duvet. I love it! Excellent quality for the price. Extra warmth for the winter. I look forward to thanksgiving every year, so I can get out my Christmas bedding! Dog seems to love it too! Comfortable and adorable sheets! My kids loved them. Perfect touch of color and cuteness for the holiday season! These sheets were not too think or too thin! Overall great buy. So and thick quality . Amazing warmth. Loved this during winter, nice and soft too! Very nice. Was very happy with the product. The fabric is very well constructed. The upsize is it held up over the winter months of washing without piling. I would re buy this in a heartbeat!! "Is this button closing? I have one with button closing and it pops open easily." Yes, it is a button closing, but I have never had an issue with it popping open. Although, I've only owned this duvet since November and use it in our RV, so it doesn't get used daily. Ditto above except that I use mine daily... no button issues so far. Have used it for a month. "Does this 100% cotton flannel duvet shrink any after washer/dryer? Over time? I have a high quality King-sized down comforter though typical combined King/California King duvets are a bit too roomy despite close comforter and duvet measurements. Heard suggestion to go with Queen-sized duvet for a plump fit but any shrinkage would definitely be too small." Hello Melissa in Flower Mound, this is a wonderful set, you should not have any issues with shrinking. Reviews have shown that this washes very well. Thanks for shopping with us! 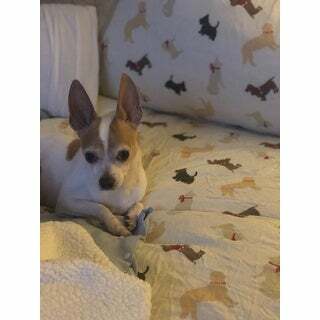 Wanted flannel cover for comforter, my daughter likes dogs.